BETHEL — Fred Seibert’s and Cindy Coughenour’s Briar Lea Inn and Jolly Drayman Pub and Restaurant on U.S. Route 2 played host to celebrity furniture last week. Yep, a simple wooden chair painted cherry red. It is being welcomed at inns and bed-and-breakfasts throughout New England as part of a consciousness-raising experiment among New England innkeepers, according to a news release from the chair’s website. “Where travelers once held photos of ‘Flat Stanley’ in unusual places, photographers now shoot photos of a humble red chair,” the release states. Flat Stanley was a paper-man cutout. “Long considered simply a place to rest one’s behind, the lowly wooden chair has been elevated to celebrity status,” the release said. Coughenour said on Sunday that the chair arrived in Bethel on Aug. 26 for four days of rest and relaxation at their inn and pub. According to red chair etiquette, it’s the host’s responsibility to take the chair to the next location. But because it was last in Kennebunkport, Coughenour said they met the person halfway to get the well-traveled seat. Then they promptly exposed it “to the beautiful and occasionally unusual places in the Bethel-area,” she said. Additionally, they created a mini-diary of the red chair’s visit, inclusive of daily journal entries and photographs of the touristy furniture’s adventures. “The red chair is a symbol,” Coughenour said. “It is a movement. It is a phenomenon. It is a happening. “As it is exploring the beauty of the New England area, it is helping us all do the same to find the simple beauty in our surroundings,” she said. “I think sometimes we get so busy in our own day-to-day activities, we forget to see the absolute beauty, the simple beauty of things that are around us. “Or for that matter, we overlook the ‘quirky’ things nearby that could bring us a smile if we only took a moment,” Coughenour said. 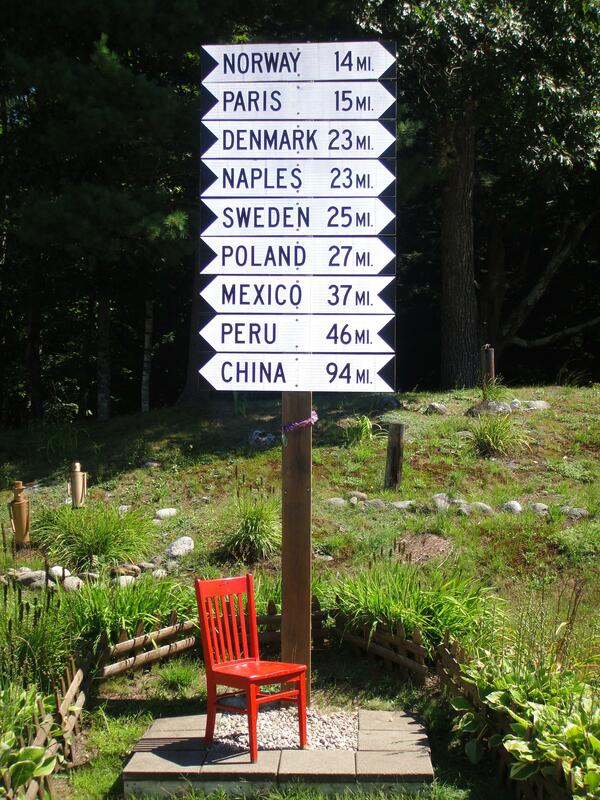 And live they did, taking the chair to places like Maine’s most famous and photographed road sign at the junction of Routes 5 and 35 in Lynchville for a portrait. 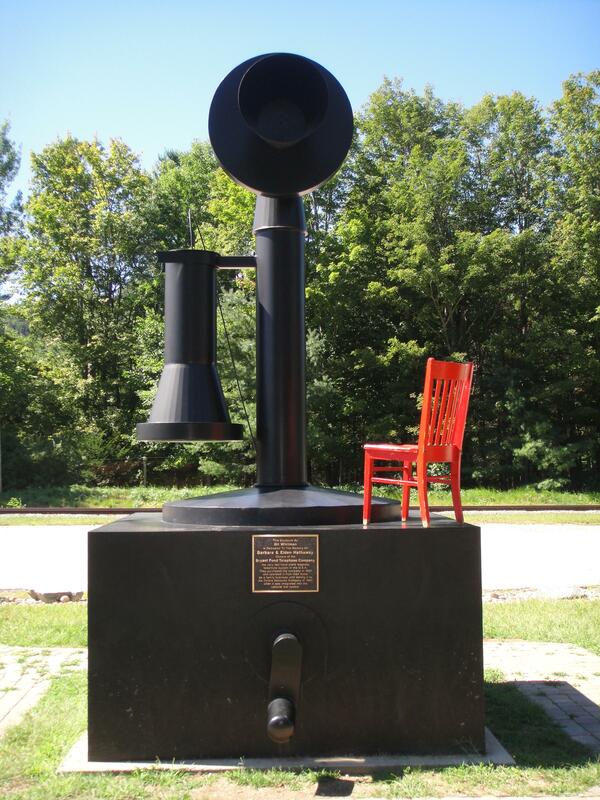 The chair also visited the World’s Largest Telephone — Bryant Pond’s colossal hand-crank phone sculpture; sojourned with Robert Frost poetry in Grafton Notch State Park on a hike and visited park waterfalls; lounged inside the Artist’s Covered Bridge in Newry; and bellied up to the bar in the Jolly Drayman Pub. “When the chair left us to continue its journey, we were sad to see it go,” Coughenour said. They took it to its next host in Gorham, N.H.
“It was like a friend leaving,” she said. “Again, a gentle reminder as to how precious time is and to not take for granted those we have in our lives. “I guess the chair made me a bit reflective; both Fred and I lost our dads, ironically, on the same day, a couple of weeks ago,” Coughenour said. 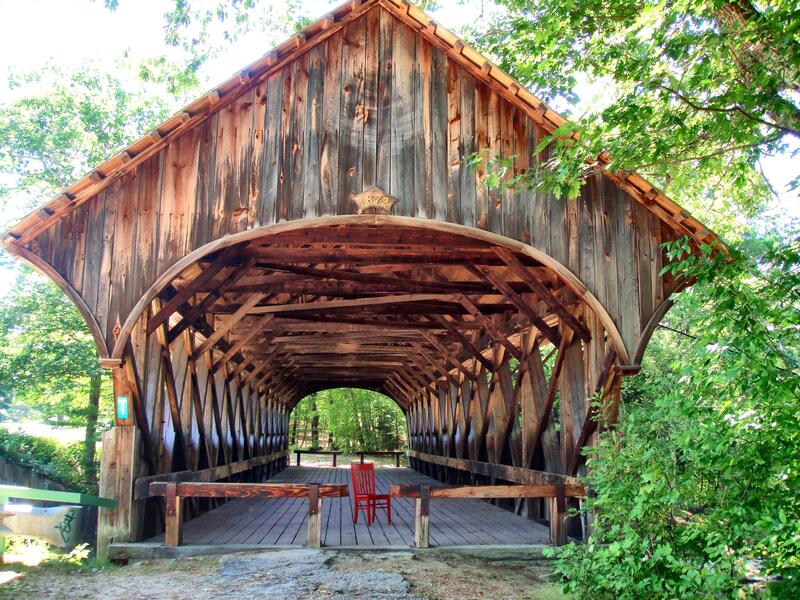 Throughout late summer and fall the red chair will travel to Rhode Island, Maine, New Hampshire, Vermont, Massachusetts and Connecticut. Photos and stories from its adventures will be added to its website as they are captured. It all started last winter. Beth Colt, innkeeper for the Woods Hole Inn, posted a picture on Facebook of her simple red chair perched on the ice behind her house. The picture was shared on the Facebook page of Julie Ann Cromer, a photographer from Santa Barbara, Calif., who was inspired by the image to visit the Woods Hole Inn. Cromer’s visit resulted in a beautiful photo of the chair on Nobska Beach, which now hangs at the Woods Hole Inn. Colt blogged about the chair. Interested fans wanted more. Inspired, Colt decided to share the chair with other innkeepers, sending it on a journey to towns and villages throughout Cape Cod last spring. To follow its adventures, visit www.redchairtravels.com.